Your body needs to work at full capacity to be fully able to resist infections and diseases, and maintain itself. Our modern lifestyle means we frequently struggle to achieve this, especially as we get older. The soil in which we grow our food no longer provides all the minerals and elements essential to our nourishment and health, no matter how much we eat. Taking daily Quinton replenishes these nutrients and minerals and helps to restore the optimum balance to maintain a healthy body and mind. It is only through correction on a continual basis using Quinton that the internal environment will be restored with over-activity calmed and under-activity boosted. For this reason, it is recommended to take Quinton daily for at least 3 months in order to achieve a more stable body homoeostasis. 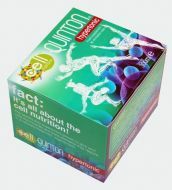 Once achieved, regular Quinton will maintain homoeostasis and optimal gene and body function. More serious imbalances can take longer to achieve correction.